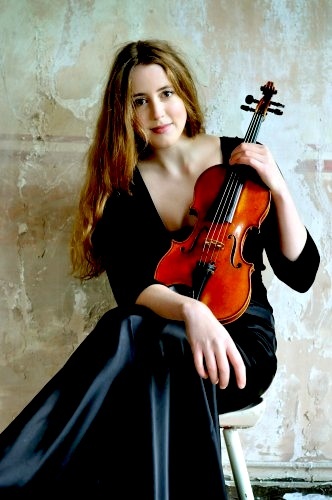 August 1, 2012, 7:20 PM · The violin concerto by Danish composer Carl Nielsen might not be the most commonly recorded or performed, but it has a passionate and highly competent champion in the 26-year-old Norwegian violinist Vilde Frang. Her new recording of the Tchaikovsky and Carl Nielsen Violin Concertos, with the Danish Radio Symphony Orchestra, is one of three she's released in rapid succession: in 2010 she recorded the Sibelius Violin Concerto and Humoresques and Prokofiev Violin Concerto No. 1; and in 2011 she recorded the Grieg Violin Sonata No. 1; Bartok Sonata for Solo Violin; and Strauss Violin Sonata, Op. 18. At the start of the year, Vilde was awarded the 2012 Credit Suisse Young Artist Award. As a part of that, she will make her debut in September with the Vienna Philharmonic under Bernard Haitink at the 2012 Lucerne Summer Music Festival. Her teachers have included Kolja Blacher at Musikhochschule Hamburg; and Ana Chumachenco at the Kronberg Academy. She also studied at the The Barratt Due Institute of Music in Oslo. She plays a Jean-Baptiste Vuillaume violin lent by the Anne-Sophie Mutter Freundeskreis Stiftung. Laurie: I'm so excited that you've recorded the Nielsen. Having perhaps never heard this piece, I was struck with how worthy and likable it is. It has moments of great beauty as well as a kaleidoscope of emotions. While the harmonies are modern, it certainly sticks to a tonal language. How did you personally discover this piece? Vilde: Nielsen was actually a very late discovery for me -- he is still quite an undiscovered composer. It's very hard to get Nielsen right; I think it's because his music isn't very obvious. Structurally, it's so free -- it swims, in a way. There is a structure, but it's a very exotic, very special, very personal kind of structure. Some people might struggle with Mahler -- Mahler has the same kind of exotic way of structuring music. Also, technically, the Nielsen is incredibly awkward. Laurie: I wondered about that. Vilde: It is, actually. When the Tchaikovsky concerto was premiered, it was considered unplayable because of its technical difficulties, and really, Nielsen is no less difficult to play than the Tchaikovsky concerto! Also, it's a lot of notes! Laurie: It's a long work, isn't it? Vilde: It's a very long work, and it's kind of inaccessible, in a way. It's not an easy listen. I enjoy much more playing this concerto than actually listening to it. When I first heard this concerto, I found it very difficult to understand. Then I had to learn this concerto. I had an orchestra engagement with the Danish Orchestra and Nielsen is sort of the great son of Denmark -- they wanted me to come and play Nielsen because part of this concerto was written in Norway. It was actually partly composed in Grieg's home. Nielsen went to visit Grieg's widow in their house, and then when he was staying there he was working in Grieg's working cottage, which is there he composed the first part of this concerto. Since I am a Norwegian, they thought they might make a point out of that. Then I discovered this piece has a lot of possibilities. It's a wonderful piece for the violin. I think every violinist should play this concerto, because you get challenged not only technically, but also structure-wise. You have to take a bird's eye view of this concerto, you need this kind of perspective. Laurie: It seems like it changes moods very quickly. Vilde: That's right, and it can be a little confusing. The challenge is to tie everything together. In that way, it's a little bit like a Danish version of the Elgar concerto actually. The end of the Elgar concerto is very long, and it's kind of the same challenge, with Nielsen. Laurie: There aren't too many recordings of it, that I found. How did you go about studying it? Honestly I don't know if I've ever heard it, ever, before now. Which is crazy! Vilde: There is a recording of Nikolaj Znaider, who made it when he was a bit younger. In a way, it's nice that there aren't any prejudices about this violin concerto. It's pretty untouched, and there is no one way to play this concerto, no general opinion. It's still pretty undiscovered. The thing about this concerto is that you can't just play this concerto 100 percent, you need to be in 140-percent shape. You need to play this music with a lot of purpose, otherwise it won't work out. If you play the Nielsen at 80 percent effort, or 80 percent technically, that sounds horrible, miserable! You need to play with a lot of energy. It might be a daunting task for most people just to approach this concerto. Also, it's very important not to forget that this is a tonal language. The notes are never just virtuoso effects; they always have a musical purpose. In some ways, this is like the Tchaikovsky Concerto. Tchaikovsky, in the first movement, has all these technical passages, but there are melodies in those passages, even though they are very high and very tricky. It's the same thing with Nielsen. It sounds weird, but it makes Nielsen-sense. Laurie: What brought you to the violin? Did you start out with the Suzuki method? My father is a double bass player, and my sister is also a double bass player -- my mother isn't a musician, actually. But I watched my sister play in youth orchestra, when I was small, and obviously I thought I was the next one in line, in the double basses family! To me it was a natural thing, but then my father made this argument: our family had a Volkswagon, which was a very tiny car. He said, 'Can you imagine, when we go on holiday, with three double basses? There is no chance the whole family will get space in the car!" So he made me a smaller instrument. It was made of cardboard -- there were no strings on it. So I could put my Little Twin Star stickers on it, and Hello Kitty stickers -- but the fact that it didn't make any sound -- I found this to be very frustrating! I had to 'play' on it for almost a year until I finally got a violin which was alive, which made sound. I remember the moment I got the violin that was real, that was really living and alive -- I've never practiced so inspired in all my life, as I did the first couple of days with that violin! I was in seventh heaven, I was so happy. Laurie: And now you have much better than a cardboard violin, you have a Vuillaume that you play, is that right? Laurie: How did that all come about, with Anne-Sophie Mutter and her foundation? Vilde: I first played for Anne-Sophie Mutter when I was 11 years old. After that, she asked me to keep her updated, and she followed my development. I kept sending her recordings and tapes of my playing, and letters about how I was doing. It was obviously a very inspirational thing for me, because I knew that she was always there watching, somewhere. When I was 15, she invited me to Munich to audition for her again, and then I was taken into her foundation, her Freundeskreis Stiftung, or Circle of Friends Foundation, and I was also given this Vuillaume instrument. I've been playing the Vuillaume for eight years now. Over the years, it's opened a lot. It has the most beautiful voice! It's not perfect; I've had a lot of fights, a lot of quarrels, with this instrument over the years. I still do, because it's got a horrible wolf on every C and B natural, in every octave! But still, I love it so much. It's not perfect, but it's like me: I'm also not perfect. I think we've improved each other so much over the years. Ms. Mutter has also been a great, great mentor to me over all these years. I did a tour with her in 2008, and we played in Carnegie Hall and Kennedy Center in Washington. I played the Bach Double with her. Of course, I learned a lot from this experience, not only playing for her, but playing with her. Laurie: She's a really spontaneous player, it seems to me. What kinds of things did you learn from her? Vilde: I think the most important was that she encouraged me to always trust my own instincts and follow my own voice. That is her top priority, and that's the message she wanted to give, which I think is a wonderful thing. But more than any other musician I know, she is extremely focused on exploring the musical score, in order to get as close as possible to the composer. Many people might consider her to be very free, but actually she has the most authentic and strictest approach that I know of. I think that is why she allows herself to have that amount of freedom. The more you know the piece and the better you know the score, the more freedom you actually have yourself. Laurie: When you won the Credit Suisse contest you were playing the wonderful Bartok Op. Posthumous, (she plays this piece in the background on this video, starting 1:40, then 3:00, etc.) I love that piece; I used to feel like I was the only one who knew about that piece, but obviously I'm not, you're playing it! Vilde: Isn't it strange? Because so few people know about this concerto, it's too bad. Laurie: I love that one movement is one thing, and the other is just complete insanity, completely unhinged. Vilde: Bartok dedicated this concerto to the girl he was so much in love with, Stefi Geyer, and it really portrays "she and he," I think. The first movement is very dedicated to her; it opens with the "Stefi" theme, which you can also find throughout the concerto. In the second movement, it's very much the young boy who is proud and he wants to make an impression on her. It shows another side of Bartok. Most people imagine Bartok as very rough composer, and I think he's actually very lyrical, and extremely pure. For me he's the most pure composer of the 20th century, actually. He's so close to Bach: he doesn't need to add anything, because it's not necessary. Something about his musical expression is so honest. Laurie: You've performed a lot of Bartok -- your second recording also has the Bartok solo Sonata. Vilde: I did record the Bartok solo Sonata, which is my favorite piece. Laurie: What makes it your favorite? Vilde: It is like a monologue, really. The structure is kind of a Baroque structure. It is like a journey, to play that piece. I've never been as focused as when playing this piece; it requires such an effort from the performer -- and also from the audience. Frankly, when I was learning this piece, I was a little bit anxious about how the audience would react to it, because it's not easy listening. I thought, 'Are they going to cough? Are they going to leave? How are they going to react?' In reality, when I'm playing the Bartok Sonata, it feels like the connection is stronger than ever. I think the audience is very hypnotized by this music. It's such a powerful piece. Laurie: You grew up in Norway, where do you live now? Vilde: I'm moving from Munich to Berlin. I've been living in Munich for five years, and I'm moving to Berlin. Laurie: What's coming up for you? Vilde: I'm looking forward to making my debut with the Vienna Philharmonic in September at the Lucerne Festival,as part of the Credit Suisse Young Artist Award, with Bernard Haitink conducting. Also, I will be making my Proms debut with the BBC Philharmonic, next summer. I'm taking part in quite a lot of festivals, and there quite a lot going on for the time being. This CD was just released in June. Laurie: You'll be doing the Sibelius with the Vienna, and you've also recorded it. Tell me your thoughts on that concerto. Vilde: The Sibelius Concerto is another close relation of mine! It's a piece I feel very attached to, and a piece I'm known for. It was such a milestone. When I was a kid, I remember listening to this piece and imagining that one day I would be able to play these notes myself. Now that I've sort of ascended that mountain, that only gave me a new perspective. Now it's a little bit like becoming this mountain, when I'm playing it. My approach to the piece is changing all the time -- I think I'm playing it very differently now from the recording I made just two years ago. Laurie: That's allowed, isn't it? It's a good sign. Vilde: I think so. It's like certain words, which change meaning over the years. When you're four years old, "love" might mean one thing, and then when you're 20 years old it might mean something else. The same thing with age 32, age 58, or 71 -- it's always changing. The power of this word is always getting different, and I think it's the same with music, no? Laurie: It's the same with music, and the wonderful thing is that I think when you're 58 it still means what it meant to you when you were four and it still means what it meant to you when you were 20, it just means more. Vilde: Yes exactly! But also you articulate it in a different way, I think, and you have a different approach to it. August 2, 2012 at 04:21 AM · Another terrific interview! I don't care for the Nielsen Concerto but I would definitely buy this violinist's Bartok. I'm kind of surprised someone (even someone as wonderful as ASM) can hand another violinist a violin (even a really good violin) and say "play this." Isn't it kind of low odds for that to be a good match? August 2, 2012 at 04:01 PM · This recording of the Tchaikovsky is awesome, I had never heard of this violinist before, very refreshing recording!